Here is an easy-to-read, down-to-earth commentary on the text of the New Testament that can be used with any Bible version. It includes book intoductions, word definitions, application tips and general articles on important aspects of Christian faith. I applaud the depth, clarity, simplicity and relevance of the Applied New Testament Commentary...its an invaluable resource. - J John, evangelist. From Kingsway.JUN96Dr Tom HaleThe APPLIED NEW TESTAMENT COMMENTARY is an easy-to-read, down-to-earth commentary on the text of the New Testament. An ideal aid for your personal quiet times, it can be used with any translation of the Bible and includes: General Articles in important aspects of the Christian faith. An introduction to each book of the New Testament. Word definitions. Clear explanations of Bible texts. How to apply the Bible to everyday life.This invaluable resource will be welcomed by leaders of small group Biblestudies, speakers, and individuals who appreciate good teaching and who will now be able to dig a little deeper.Dr Tom Hale is a missionary working with Interserve, and also the author of several books, including DONT LET THE GOATS EAT THE LOQUAT TREES and LIVING STONES OF THE HIMALAYAS.From Kingsway. 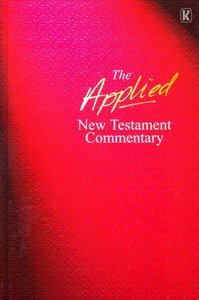 About "Applied New Testament Commentary"
A commentary for use with any version of the Bible, containing general articles, explanation of the Bible text, and a strong application element.